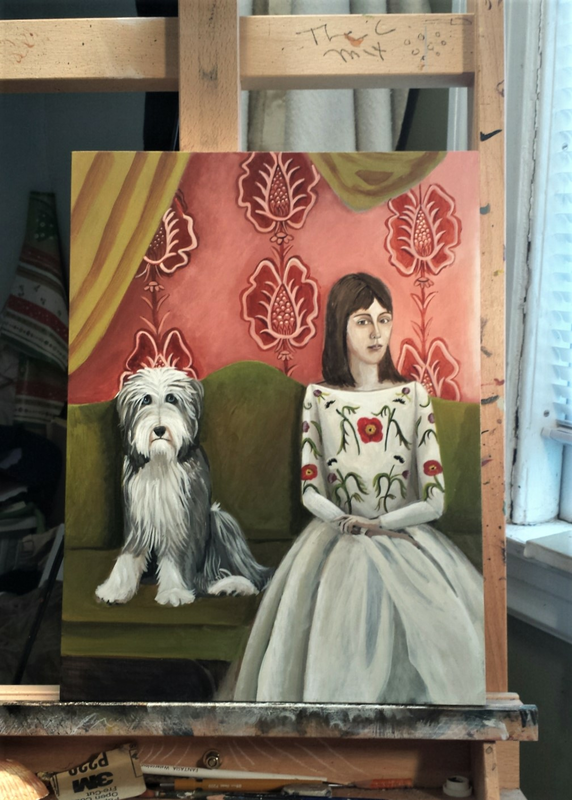 Completed on 3-30-2017 In keeping with my series of animal sitters, meet Regina! 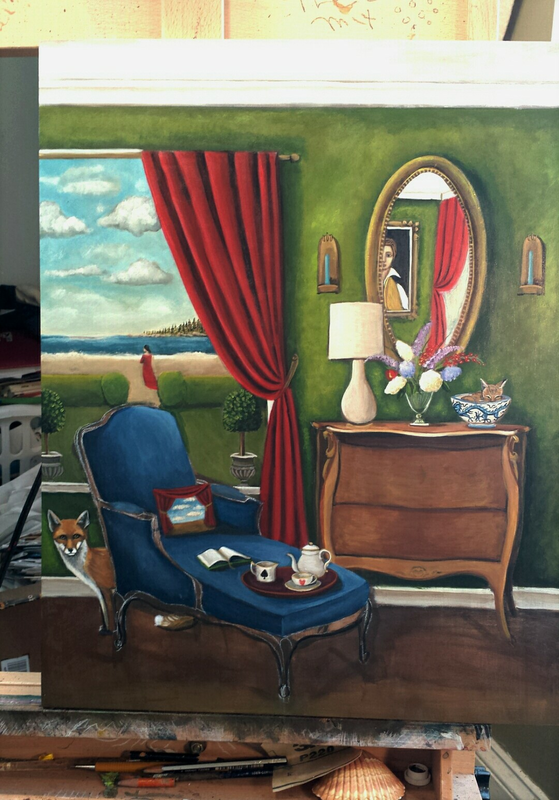 She and Natalie (the sheep dog ) are painted on a 12x16 cradled wood panel with painted sides. Working on this 12x16 piece. So far I've done The Cat Sitter, The Bunny Sitter so I figured it was time for a dog sitter. Enjoying my new paints and brushes too. Completed on 3-21-2017. Pine Point is actually in Scarborough, Maine and extends for four miles along Saco Bay and the Atlantic Ocean. I spent the weekend in Cape Elizabeth the next town over. Three of my five sisters live there. It's a beautiful rugged area "Andrew Wyeth country." Anyway, I used a few new techniques and did lots of glazing which gives such lovely luminous depth as well. One of my more epic pieces. Gracie made her way into the chinoiserie bowl along with a Maine woodland creature. 16x20 on a cradled wood panel. Thanks for looking. Coming along with a little more detail for today. Taken with my phone . Gracie made her way into it. There may be some others. 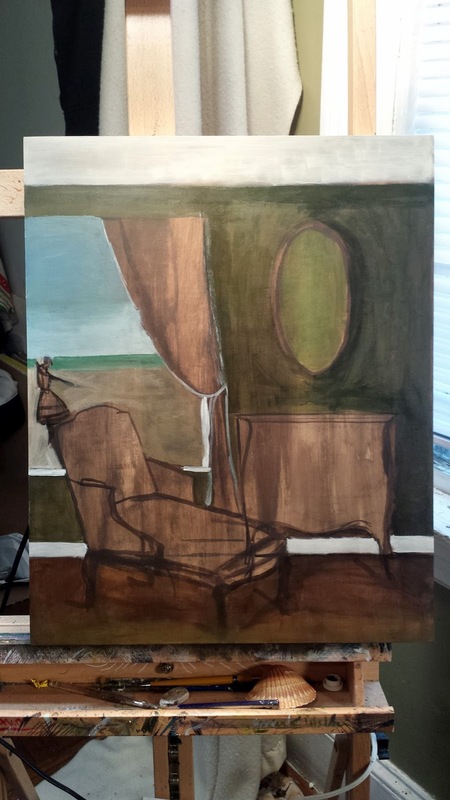 I've started a larger piece, 16x20. I am at the very beginning stages and sometimes I have it all figured out and sometimes the painting figures itself out. After spending the weekend in Maine I am inspired . 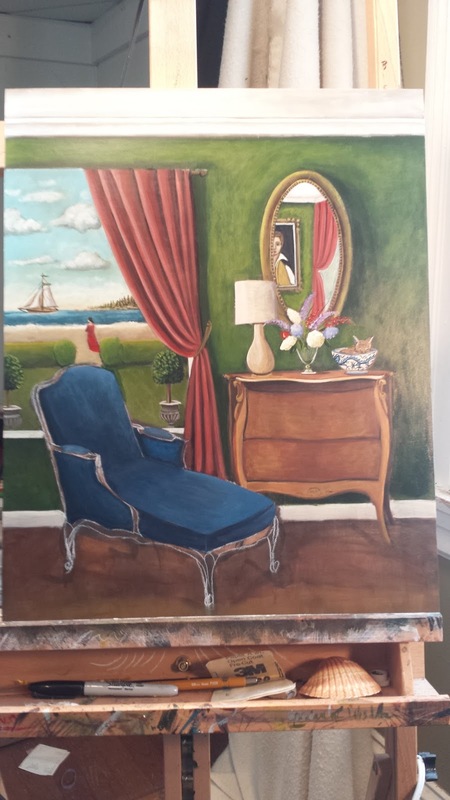 So glad I was able to complete this piece today since I am heading out to Maine for a family party tonight. It's 11x14 on a cardled wood panel with painted sides. I am quite pleased with my bunny sitter. I worked on making her with a renaissance appeal. The face reminds me of an opal and more lovely in person! Completed on 3-3-2017 . 16x12 on a cradled wood panel with painted sides. I was initially inspired by Rene Magritte's painting "Homage To Mack Sennett" 1934. I love many things about his work -Surrealism, use of furniture ,objects, and birds to name a few. I would like to think there are guardian angles out there living among us. Thanks for looking. For sale on my website and etsy shop.